I watched this movie again while channel surfing HBO last night. I had forgotten most of the details, and I thoroughly enjoyed it. I had also forgotten that I had actually reviewed it. When I re-read this review, I thought it was spot on. I would have written exactly the same thing again. Some viewers might come away from this movie disappointed. For me, I got exactly what I expected. A comedy with a pop-culture backdrop that I was interested in. There is enough mystique about Woodstock to feed another generation’s marvelings. I went to the town of Woodstock once, only to realize it wasn’t Woodstock where the concert took place, but Bethel. Why we’re not calling it the Bethel festival I don’t know. I am sure a lot of others of my generation, who were to young at the time, drive into Woodstock off of I-87 and stop at a diner, just to have been there. This generation has altered the composition of the atmosphere on a global scale through … a steady increase in carbon dioxide from the burning of fossil fuels. Troposphere, whatever. I told you before I’m not a scientist. That’s why I don’t want to deal with global warming. Here is a hilarious movie review by a fellow blogger. Enjoy! Michael J. Fox negotiated the deal for “Family Ties” (1982) from a phone booth outside a now defunct Pioneer Chicken restaurant in Hollywood because he had no phone at home. He was told the network would need to call, and he said he was only home between the hours of four and five. He waited for the call, and fortunately he was there to answer it and secure the “Family Ties” (1982) role. Thinking of translations from German has reminded me of The Panther – so I repost it here. I find it phenomenally difficult to translate a poem to another language. It’s a unique art form that way – very culture bound, unlike literature, music and visual arts. Came across this 3-year-old post about sloppy paintings by the masters. Thought I should repost it. 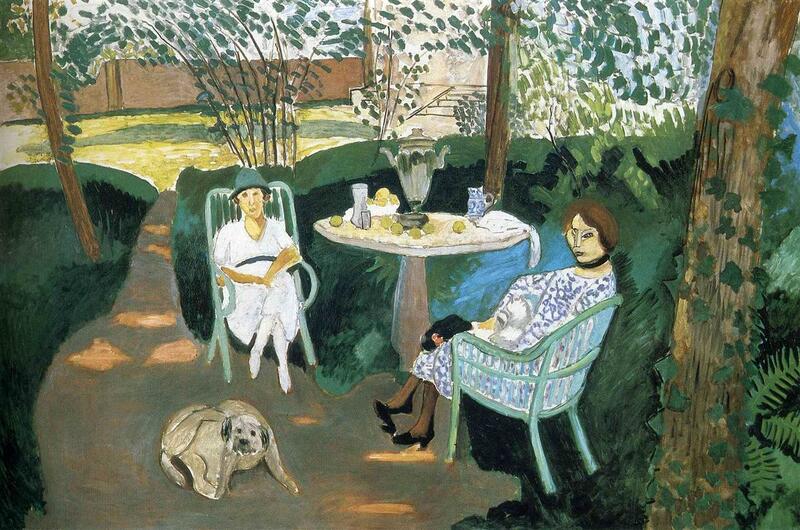 Source WikiArt [click to enlarge] Last week I visited the Los Angeles County Museum of Art (LACMA) and saw the original Tea in the Garden by Henri Matisse. I love Matisse, and most of his contemporaries including van Gogh (my favorite), Monet, Manet, Gaugin, Cezanne, Seurat – and many others of the period. When I go to an art museum, I usually seek out those artists first, before I wonder off into rooms with the older European paintings. Often it strikes me how “unfinished” the paintings of the masters are. I saw many versions of van Gogh’s irises (Google it and you will see) where there is bare canvas between brushstrokes indicating leaves. I stumbled upon this old post and thought it would be worth refreshing. And while we’re talking about Africa, here is a bit of trivia that may surprise you. What is the U.S. state closest to Africa? The size of Africa, being in the center of the world map, often is distorted to its disadvantage. Greenland, Alaska and Siberia look huge, Africa just looks big. How big really is it? Size of Africa [click for picture credit] As you can see on this map, Africa is bigger than most of Europe, the United States, China, Japan and India combined. Will Guns in Schools Protect Children? Here is a post I wrote on April 8, 2013 – note that this is almost five years ago, before Trump was even on our horizon as a serious candidate. I called it them. Guns in school won’t make children safer. Then – or Now. Here is a picture posted by Marc Sonnenberg. 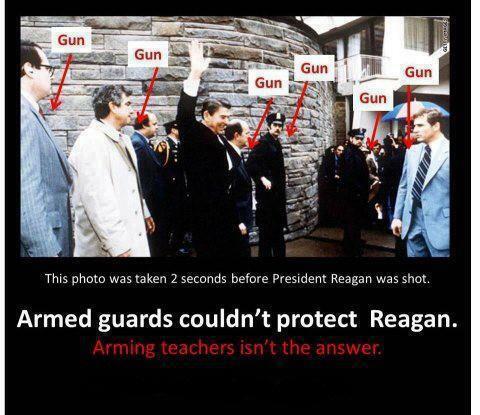 It was taken 2 seconds before Reagan was shot. He was surrounded by Secret Service agents, who are some of the most finely trained gunmen and security experts we have in this country. Some very interesting musings about free speech, a topic dear to me, too, and a segment about Trump and transgender people in the military. Nice post! If you haven’t yet read about the Google employee who was fired for questioning the company’s diversity policy, then you need to do so immediately. I couldn’t care less what your opinion is on this man’s statements (they’re actually pretty mild in my opinion), but it’s obvious to me that the company’s reaction to this was way out of proportion to the “crime” committed. It’s already been proven that Google has far Left political leanings & isn’t afraid to exploit its power to try to sway public opinion. This was evidenced when analyses found that Google’s suggested searches on Hillary Clinton were largely positive while its suggested searches on Donald Trump were largely negative. But that’s a story for another day. The Latin Corner – a reblog. Before Wolfgang’s Latin contributions, I had this 2012 entry, which gets occasional hits from Internet searches. Worth a reblog. I venture to say that 99% of Americans cannot read Latin. I only know one other American I know who can, and I know more than 100 people. I might have missed one or two of you that are clandestine Latin readers, if so, please correct me. No matter how small the percentage actually is, the efficacy of this bumper sticker is severely limited. Even though this post is over 7 years old, I still get nice comments from readers from all over the country. I was planning on going back to the Adirondacks this week after a conference in Saratoga, but didn’t make it this year. Things got too busy at work. I miss the Adirondacks, and here’s to share some of its adventure! I finally hiked Mt. Marcy, with 5,344 feet the highest peak in New York, and an adventure it was. I am a West Coast hiker. I am used to blue sky, heat in the day, cold at night, the need for sunscreen, high altitude trailheads and even higher peaks. And I am used to switchbacks. The Adirondacks are a whole different beast. Mt. 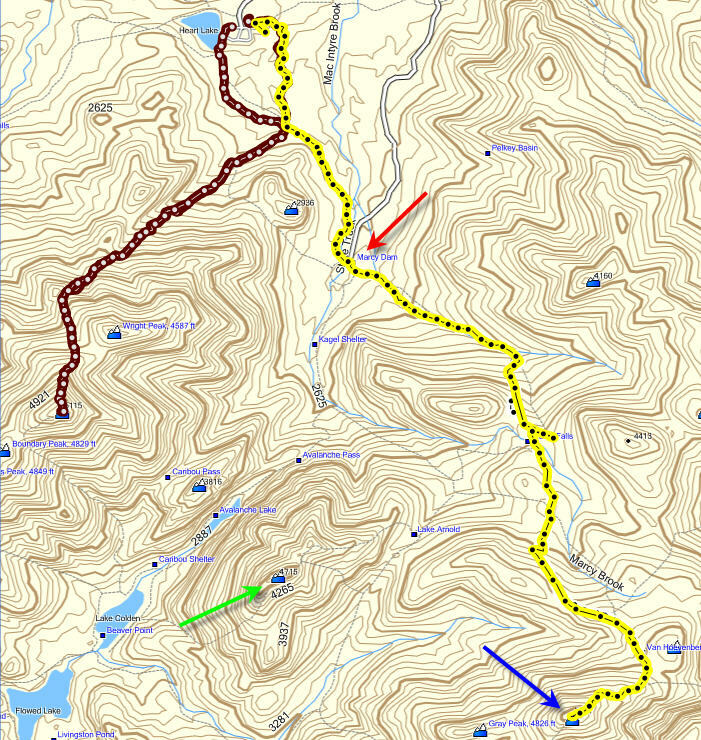 Marcy has a number of reasonable trails reaching it, the shortest of which starts at the Adirondack Loj (spelling intentional by its builder, Melvil Dewey, who was an advocate of “simplified spelling”) at Heart Lake. The trail is 7.2 miles long. Marcy is therefore a fairly remote hike. I can do 7.2 miles one way, no problem. But the trail up Marcy is not different from the trail up Algonquin and Ampersand. Straight up, all the time.